This is a nice item and the build quality is solid. There’s no flexing or creaking, and it feels as though it can take a beating. It’s comfortable in-hand; so long runs of scanning for inventory and such shouldn’t be a problem. Set up is easy because it’s compatible with pretty much every major barcode reader-capable system you can think of. And it’s super customizable – type of beep, beep volume, sleep duration … tons of different settings available, and the can be set simply be scanning a pre-set barcode. The included documentation includes barcodes for all of the available settings. As for the unit itself, it can be used either in wireless mode, or via direct connection using a USB connector (included). For wireless connection, a dongle has been included, which you will install in a USB port on your computer or laptop. The dongle illuminates blue when it’s plugged in. It sets up it’s own wireless connection, and the reader connects really quickly. My laptop (running Windows 10) had no problem recognizing the dongle. One thing that’s cool about this reader is than be used in either “Inventory” mode, or “Normal” mode. In Normal mode, when you scan a barcode, the data is transferred directly to the computer. Inventory mode is handy for when you need to scan barcodes, which are out of range of the dongle. In Inventory mode, any barcodes scanned are stored directly on the scanner itself. Once scanning is completed, you run the “Transmit Data” command (also via barcode), and the stored codes are then transmitted all at once to the computer. Your specific usage will determine what modes you use, but I think Inventory mode can be a really convenient feature, as long as you’re set up to use the data dump properly. As for actual scanning, range seems to be really good – I’ve been able to get codes to scan up to 3 feet away! I have no idea if that range will remain over time, but I think it’s great for a wireless handheld unit. And it seems that I can do about one scan every second and a half, or so, which is pretty quick. I currently have a wired handheld unit at my current business, which we use for retail sales, and to scan in inventory as it is received. That system uses Quickbooks POS software. To try out this scanner, I temporarily exchanged out the original scanner for this eSky unit. Windows (Vista) and Quickbooks recognized the scanner as an input method just as well as the original gun, and it’s actually much more convenient for inventory, because I can bring the scanner down to the box, instead of lifting the box onto the desk to the scanner. I will eventually replace the wired gun permanently, once I change the cradle to one that will hold this gun (it doesn’t come with a cradle). 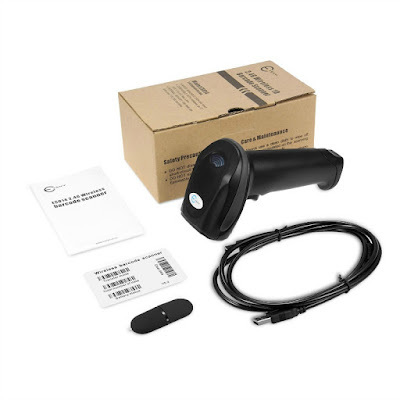 16MB 200 Scans Sec Laser Handheld Barcode Scanner by Esky lists for $169.99 and is currently on sales for $49.99 on Amazon. This item comes with a 30-Day Money Back Guarantee and Lifetime Support Guarantee.